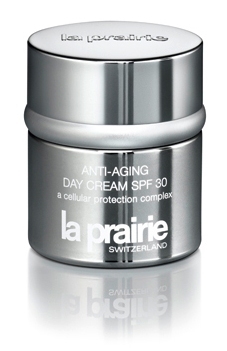 I was fortunate enough to receive La Prairie's Anti-Aging Day Cream SPF 30 ($200) as a gift from La Prairie. I have been hoarding it and saving it for the summer. I have honestly never used a sunscreen that has been so perfect. I have been slathering it on in the morning, popping on mascara, eyeliner, a cream blush and lip gloss, and then running out the door. My skin looks hydrated, luminous and I get SPF 30 protection?! As I have been getting older (think 40+) I have been religious about using tinted moisturizer or foundation to even out my skin tone. Not necessary with this miracle cream. What a lucky discovery! Note: I would not use this as a sport sunscreen (for tennis or beach), but it is the most perfect every day sunscreen ever!